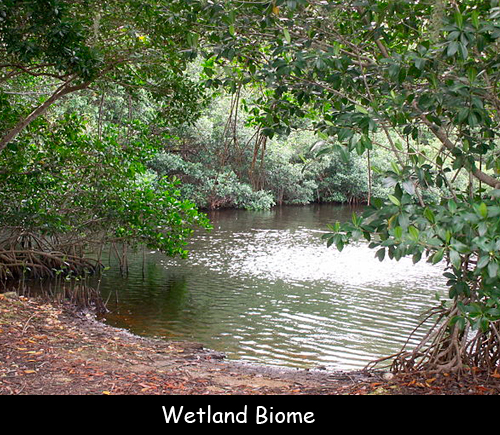 A Wetland Biome can be defined as an area which lies between the wet ecosystem and terrestrial ecosystem. It is damp and here water is always going to be standing still. This biome includes swamp, marshes and bogs and can be made of freshwater, saltwater or the combination of the two. They exist on every continent except for Antarctica. Plants found in wetlands are adapted to moist and humid conditions and are known as hydrophytes. People might think of these biomes as a wasteland but they actually help in cleaning our drinking water. They are also responsible for keeping rivers at a normal level. A Wetland Biome is completely covered by shallow water or the soil soaked with water. They are most commonly found in low-lying regions where the soil is very swampy. They are very close to lakes, rivers, and streams. These biomes are home to a wide range of plant and animal life so they are considered to be the most biologically diverse. Here you can find several birds, like geese, swans, ducks, herons, waterfowls and waders. These ecological features reduce water pollution by filtering incoming water and removing waste. In specific seasons these wetlands may remain dry. These ecosystems cannot exist in geographical areas which remain frozen. They also serve as a reservoir for excessive rainfall to prevent flooding by soaking the flood water very fast and sending it back to the ground. In these areas annual rainfall can fluctuate depending on the location. Average annual rainfall can range from 72 to 200 inches. Declan, Tobin. " Wetland Biome Fun Facts for Kids ." Easy Science for Kids, Apr 2019. Web. 24 Apr 2019. < https://easyscienceforkids.com/wetland-biome/ >.